As those colleagues and friends who specialise in material culture never fail to remind me, my research interests have primarily tended towards the intangible aspects of folklore, particularly in verbal and musical tradition. It would be wrong, however, to portray me as wholly resistant to material culture. It's just that I know the limitations of my informed knowledge. Which is why this post is really an appeal for some (possibly quite basic) information. I recently and belatedly got to visit the Lilliput Doll and Toy Museum in Brading. It's a really excellent small museum of children's toys and dolls: crowded but well-maintained displays, with the tempting allure of how much more they have in store. It's lovely - charming and fascinating. 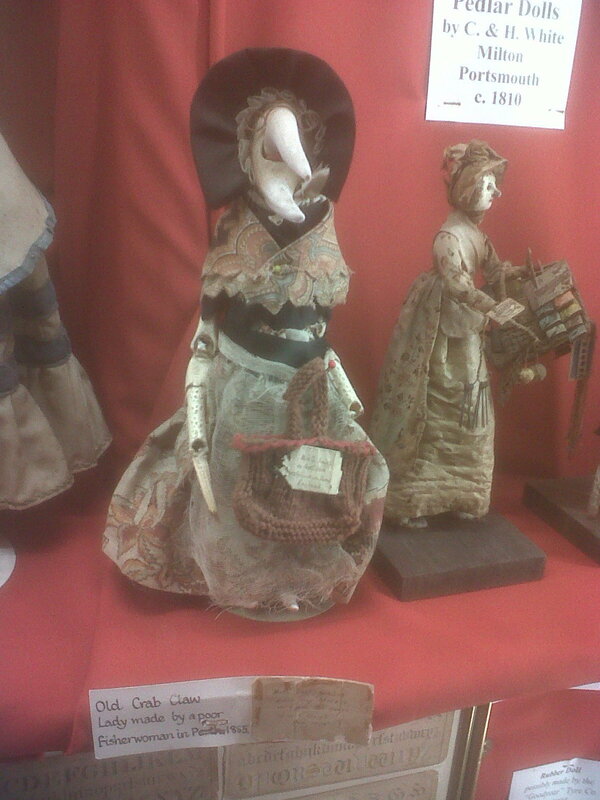 My eye was caught by this astonishing piece, a doll made of crab's claws and dressed. The notice explains that she's mid-nineteenth century (1865), made by 'a poor fisherwoman in Perth'. Nearby in the case (not shown in this photo) is a rather fancy pedlar doll made by a small Portsmouth company: she is distinguished by the quality of reproduction of the items in her pedlar's basket, but once you strip down the astonishing craftsmanship there you find that she is, at core, the extremely traditional pegdoll, a clothespeg with a painted face and dressed. 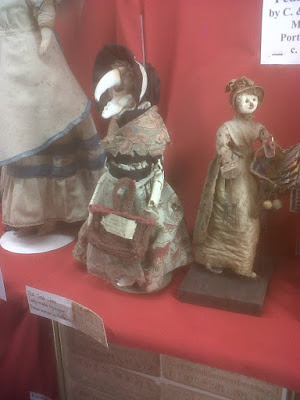 The pegdoll suggests traditional crafts being adapted for commercial purposes, which is all straightforward enough, but I had not come across such crab dolls before. So here is my question: is this the crafted invention of a particularly imaginative and gifted individual alone, or is it also reflective of a broader tradition of making such dolls? Can anyone point me to readings on this? And if you can't, don't worry. Just enjoy the magnificent craft and skill on display here.